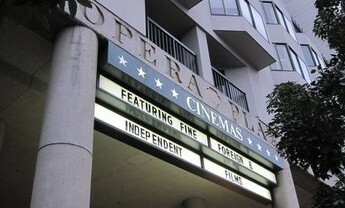 Located on Van Ness Avenue near San Francisco’s Civic Center, the Opera Plaza Cinema caters to filmgoers who appreciate a quiet, comfortable experience. Popular independent and foreign films often move here for one last engagement before leaving the city altogether. With two cozy screening rooms and two larger auditoriums, San Francisco film lovers always have a choice. Centrally located, the OPC is within two blocks of City Hall, Davies Symphony Hall, and the amazing Downtown Library building.